Overcast sky is a welcome change from the dry summer heat, and feeling a little frazzled of late, I decide to follow a nagging inner stirring to connect more intimately with the elements of nature – especially the ocean. I find being near or in the ocean very relaxing and is how I allow Mother Nature to nurture me. 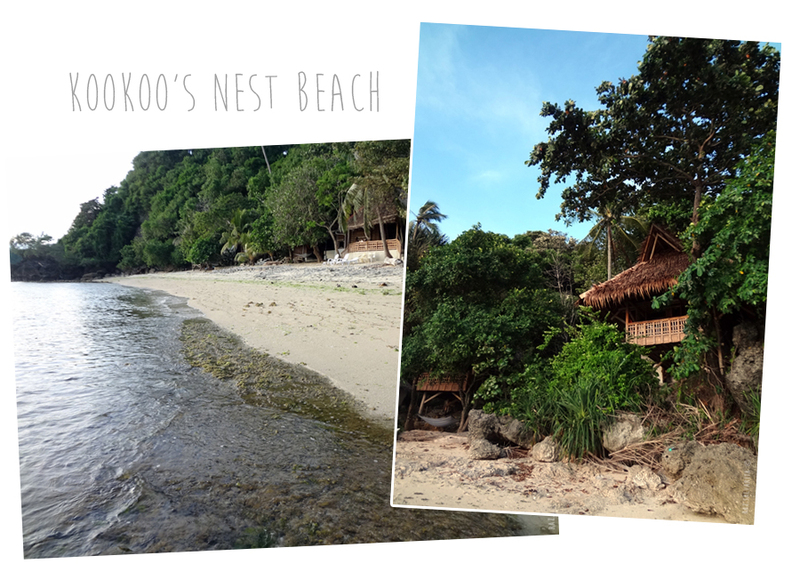 So, Raz and I pack lightly the bare minimum of clothing and head to the respite of the secluded beachside cottages of Kookoo’s Nest at Tambobo Bay, Negros Oriental-Philippines. Gazing into the vastness of the uninterrupted ocean view, with a cloudy horizon, I breathe deeply the salt sea air being carried by the stiff breeze. This is not the usual tranquil scene that greets me. The ocean today seems to be reflecting to me the turmoil going on in my mind and body; the waves look wild and angry, the sky dull and cloudy, such a stark comparison to my previous visits. I feel and know that these couple of days away from the Art Hub Studio is a re-birthing of sorts; but first there needs to be a letting go, detachment from all that does not serve the growth of my Soul any longer. A de-programming from other people’s opinions, beliefs and ideas, that I have allowed myself to buy into – yes buy into at great expense, not only in the pocket physically, but also mentally and emotionally. 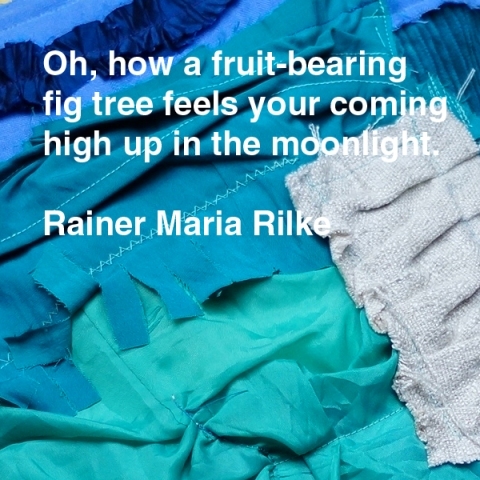 As I see more clearly into the patterns and dramas that have been playing out within my field of experience, and sharing and expressing to Raz the feelings that are arising, consciously and honestly, I become aware that my eyesight is improving. Raz passes me a tricycle magazine suggesting I read the article from the editor titled ‘The Buddhist Review’. As I reach for my eye glasses I notice I do not need them, I can read the small print perfectly well. I see this as confirmation that a shift is certainly occurring. There is a heightened sensitivity with my hearing; the usual unnoticed background sounds of nature are now more distinct as I relax with breath and awareness. Relaxing time and playing with the wind. The sea pounding against the huge rock boulders on either side of this small sandy cove is creating a constant crashing sound and every so often there is a deep howling cry, as if coming from the depths of the ocean herself. 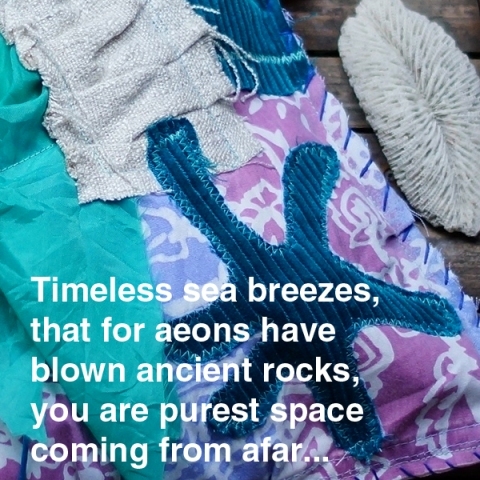 The strong wind is whipping the waves into a surging froth on the incoming tide, dumping algae and rubbish onto the white sandy beach – mixed with small shrapnel pieces of coral. 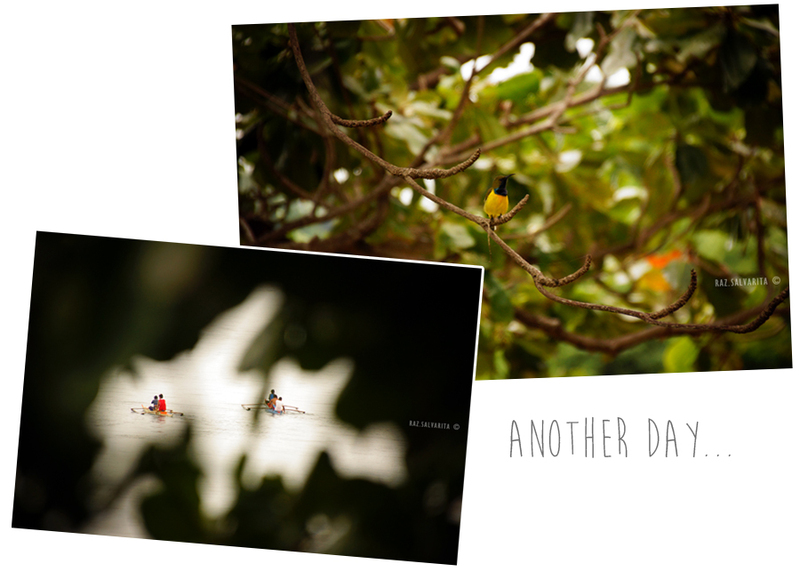 In-between a sip of coffee I think out loud ‘I wonder what is creating that deep roaring sound? I resist the temptation to tilt into defensiveness, and see this as an opportunity to release further, the old patterning around authority issues. With direct questioning I have always felt a sense of being attacked, thus triggering self-protection, seriousness and control. I can see clearly how I have subtly manipulated or exaggerated situations for the need to justify, and to be right. So I breathe deeply once more to listen to the ocean, but my mind is focused on the brewing storm clouds. A little skeptical, I observe the sight-and-sound show Mother Nature is performing to perfection. The deep roaring is actually coming through the air bubbles on the tip of the wave, the force of the gusts of wind moving through the waves crest, creating the sound. I laugh out loud at the simple learning from nature, showing me how I allow myself to easily get caught up in the roar and din of passing surface trivia, thinking that it is ‘oh, so deep and meaningful’. 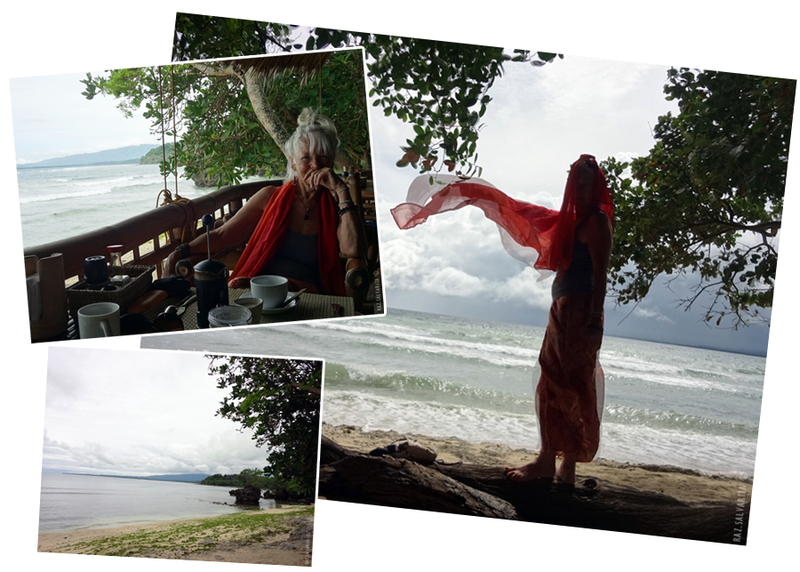 The nights’ hum of insects is overshadowed by the constant crashing of the waves on the rocks below our little bamboo hut. I rise around 2 A.M., to the sound of strong wind and rain. Peering from the balcony into the darkness of nature’s wild symphony, the horizon is lit up like a major city at Christmas time. Fairy lights bobbing about in the swell as far as the eyes can see – fishing boats working night shift under the stormy weather conditions. I breathe a relaxed sigh of gratitude and return to the comfort and warmth of the bed. The dawn of the new day brings a surprising stillness. The ocean is calm and silent but for the gentle lapping of very small waves caressing the shoreline. The beach is clean from the green algae and trash of yesterday; a new day, a new beginning; the sun’s rays are filtering through an overcast sky displaying sparkles of light dancing on a silky smooth ocean of silvery grey-green hues. Being silent with the ‘stillness’ on the surface allows me to see more deeply into my own reflection. As with the changing seasons of nature, the changing of the tide, the high and the low, so too is there a symbology and wisdom for us humans to follow. Change is imminent and as I learn to flow and grow in the ripeness of time with the elements around me, I feel more relaxed and alive. Enjoying a late scrumptious breakfast I watch the last of the fishing boats returning to their village in the bay on the other side of the rocky cliffs. 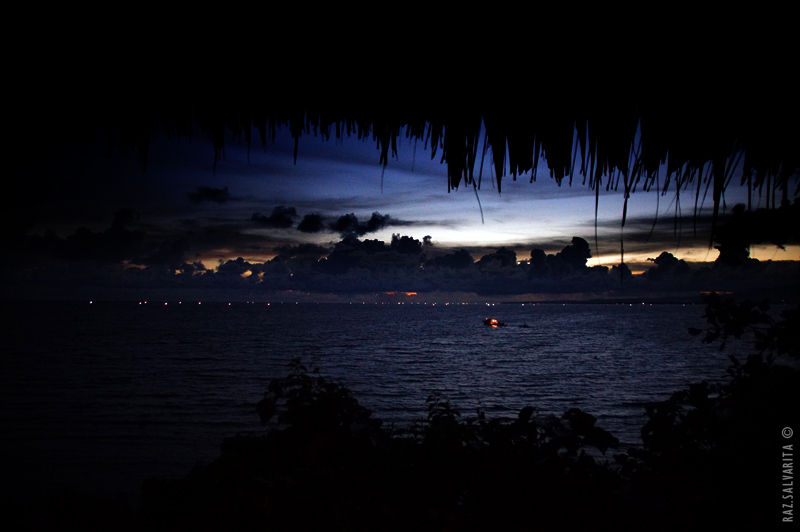 These fisher folk work in the darkness of night, under all-weather conditions, so that I can enjoy the fresh ‘catch of the day’ for my evening meal is very humbling indeed. P.S. 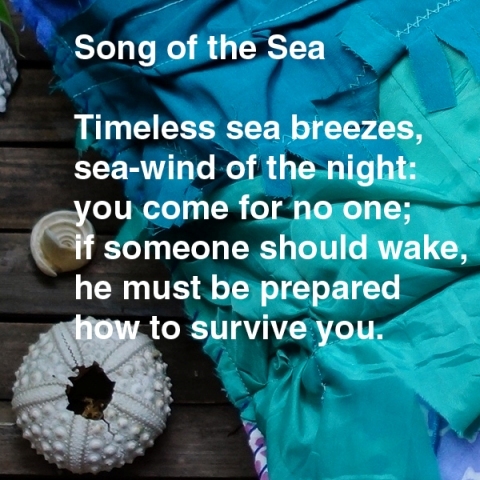 I thank my best friend Ra’zsal for all the images used throughout my blogs unless otherwise stated… and here’s a poem by Rainer Maria Rilke, Song of the Sea.